Dr. Hearst was born in the heart of West Philadelphia, was educated in the Philadelphia Public Schools and is a proud veteran of the United States Air Force. Dr. Hearst earned his Doctor of Ministry degree from Eastern Seminary (now Palmer) in 1999. Dr. Hearst has been serving faithfully here at Bethel AME Church in Moorestown, NJ since November 2003. He serves as the Secretary of the New Jersey Annual Conference, a member of the Board of Examiners, the Board of Trustees, the Finance Committee, and the Ministerial Efficiency Committee of the New Jersey Annual Conference. 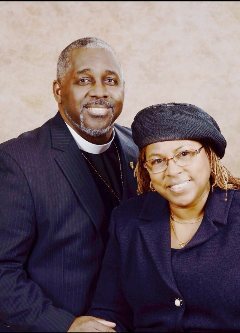 Dr. Hearst is an Adjunct Professor at Lancaster Bible College@ The Center for Urban Theological Studies (LBC@CUTS) in Philadelphia, PA.
Dr. Hearst is married to Mrs. Sharon Y. Hearst, our First Lady. Together they are the proud parents of Toriano, Kasean and The Rev. Dr. Stanley Hearst II, Pastor of Mount Pisgah AME Church, Jersey City, NJ. They are also the proud grandparents of Julian and Tory.